Review posted November 22, 2018. Crown Publishing (Penguin Random House), 2016. 38 pages. What’s so awesome about it? The arbitrariness of the selection of things listed – and the excellent graphic design representation of those things. The pleasing, bright colors. The question at the end (Awesome or not awesome?). On the front you see a few small pictures that will come later, and they’re marked fig. 1 through fig. 5. That gives you the idea. The pictures have the look of infographics. Here are the first several awesome things from this book. The book consists of an infographic of each thing, with the name of the thing printed on the page as well. 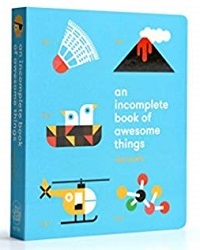 The final page reads, “Awesome or not awesome?” and shows eight more things. The graphic design is awesome. I especially like the pages for DANDELIONS and CONFETTI. This book reminds me very much of 14,000 Things to Be Happy About, by Barbara Ann Kipfer, except it’s for toddlers and their awesome parents.